It was March 11 and all I could think about was what shade of green I’d wear for St. Patrick’s Day the next Monday. Green tie? Oh Yeah. Green shirt? Maybe not. Shamrock undershorts? I wouldn’t tell. But for that day, it was bright safety yellow as Daylight Savings time robbed me of the sun on my morning 10k at 5:30 a.m. The blinking green headlamp was as close to festive colors as I could muster. Dodging the black ice that seems to indicate eternal winter, I muddled my way to a sunrise finish an hour later. A nice treat to a frozen good morning. Walking my cool down… funny point, eh? I wiped the frost off my 2013 Boston Marathon hat. Staring at it in my hands, I focused on the date printed on the brim: April 15, 2013. The last time I wore the very same hat, I was smiling at the Boston Marathon finish line at 2:45 or so in the afternoon. A few minutes ahead of my “bet I can finish before 3 o’clock” promise to my 15-year-old son. The cold of the marathon day, like the morning of March 11, created a wonderful to be alive rush. 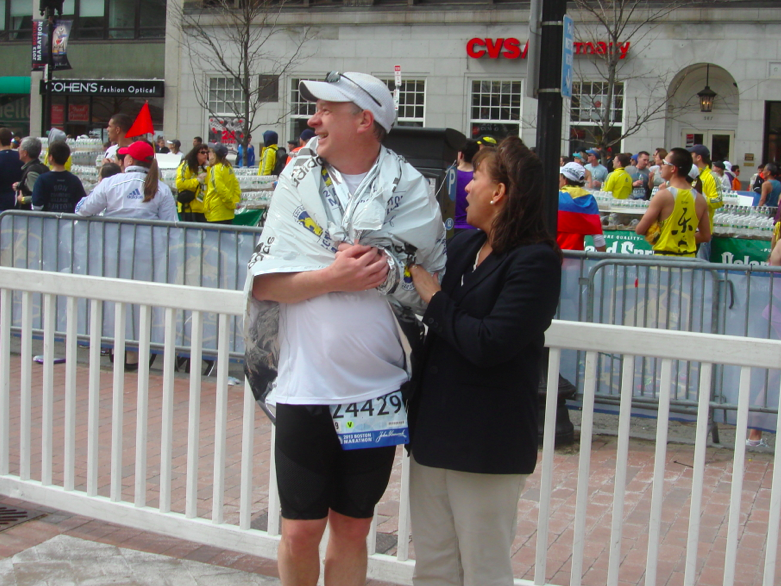 My mind went back to posing for a photo with my wife only yards from the 2013 Boston Marathon finish line….Boom! “What the—?” Terror was in the air. On the ground. In front of me. Calm and chaos. Frozen for real. The Boston police officer carefully walked over to me. Politely, he asked if my hotel was nearby. When I answered, “Yes”, he then requested I move towards it as bad things could still happen. Then, “Boom” number-two. Time to listen. The tiredness of a sub-4 marathon finish time immediately left me. I was surprised to see I even had adrenaline left in me. I stare at the hat once again as the sun came up on the morning of March 11. Clenched in my hand, I walked alone. Only 30 more days until I wear my Boston Marathon 2014 hat. Yes I will be glad to change hats… but not glad to erase memories that only make me stronger. And yes, I’ll tip my hat where the two bomb explosions occurred in front of the Atlantic Fish Company and Marathon Sports on Boylston Street before crossing the 2014 Boston Marathon finish line again. Follow Brian on his 140 day challenge between the 2014 Boston Marathon and the 2014 Boulder, CO Ironman on Twitter @PivotCEO or www.Pivot.com.